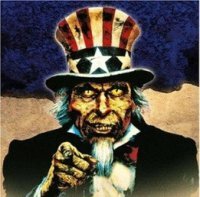 Yet another article, this one by Michael Hudson, that argues that the US has not only shot itself in the foot - thanks to its crazed army of the neocon living dead - but has also driven a wooden stake through its own heart. That's what comes of letting the Nosferatu's of the world free rein to fill their bloody purses at the expense of others. Yes I was warned. I'm not sure why. 1. Maduro is a bad guy and the Venezuelan people should of their own accord rise up. 2. US motives are suspect in all this. That's three things as I measure it (1. Maduro is a bad guy - 2. Venezuelan people should rise up... - 3. US motive are suspect). I don't actually think either of those first two are accurate. Maduro won by popular vote. If the Venezuelan people wanted to rise up against him they wouldn't need outside forces - the USA - to agitate against him and leak plans for using 5,000 troops to ignite regime change (and yep, the US are definitely suspect in this). The US has no business interfering in the internal affairs of other nations, especially since it argues that no foreign power should interfere in their own affairs. Fundamentally, one has to hold the moral high ground in order to preach to others. The US, these days, has sunk to the moral sewers. I agree, **** the US. I concede that point. Being elected doesnt automatically make you a good guy, Maduro has ruled by dictate for most of his term and has precipitated a refugee crisis worse than the Syrian Civil War. If Venezuelans are okay with that so be it, no skin off my back. That's just the humble opinion of a foreigner. I posted this same article early yesterday. The opposition is also a socialist and he hasn't been elected. What is Trump's justification? And I agree with you about Maduro not necessarily being a good guy albeit an elected one. We could both say the same about Tony Blair or Margaret Thatcher, G W Bush, Obama and that **** Clinton as well as Macron et al. For all their many, many failings and criminalities, no one seriously considered regime changing them. There's the fundamental difference right there. All were inside the Western / USA camp and knew to do what the US wanted them to do. That was their ticket to survival and prosperity. Venezuela is outside that camp and that can't be tolerated given that it is inside the Western hemisphere and owns the largest oil reserves in the world -- ergo; it must be regime changed. Democracy as a system of governance is imperfect and those who stand for election usually even more so. But what else is there that would gain popular support? Once upon a time, way back, candidates for election seemed generally better - but maybe it's rose tinted glasses I'm wearing? Bolton and Trump seem to think they can take control of Venezuela's oil production. I find that very scary. Is there no mechanism for the US to help or advise VZ instead of kicking them when they're down? Get rid of the US neocons is my solution. It will soften the many coming blows to the US. Contra boys turned their attention to the world’s largest oil reserves in Venezuela: The United States is now the greatest threat to peace on the planet. But cobalt looms as a larger concern for some automakers. Roughly 62 percent global cobalt output is found in the Democratic Republic of Congo. An executive from Ford said recently that automakers might feel compelled to invest directly in cobalt production over fears of securing adequate supply. “I fully anticipate we’re going to keep a lot of pressure on that cobalt production,” Ted Miller, head of energy storage strategy and research at Ford, said at a mining event in South Africa. “Today it looks feasible but it’s a scenario we’re going to have to watch.